Judi Grissmeyer is leading SCE's efforts to reroute power and telecommunications lines to clear the path for the last space shuttle external tank as it moves from Marina Del Ray to the California Science Center. An SCE team worked for months preparing for electricity to be rerouted and power lines to be moved for the space shuttle’s external tank trip from Marina del Rey to the California Science Center on May 20-21. A major effort by SCE to move power lines and streetlights paves the way for the tank’s trip from Marina del Rey to the California Science Center. 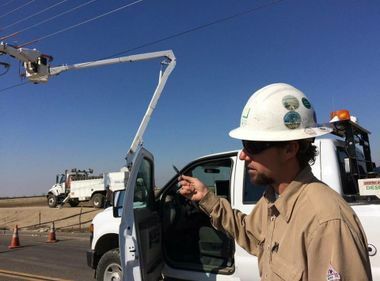 On a typical day, Judi Grissmeyer keeps busy in her Southern California Edison office in West Covina working with cities and agencies coordinating the relocation of power poles for street widenings or other projects. But this week she has a bigger challenge — 65,000 pounds bigger. Grissmeyer is leading SCE’s effort to reroute power and telecommunications lines to clear the path for the last space shuttle external tank, which will be transported Friday night and Saturday along city streets from Marina del Rey to the California Science Center in Los Angeles. “It is very exciting for SCE to be part of the science center’s historic project,” said Grissmeyer. The external tank was the shuttle’s “gas tank,” providing the propellants to lift it into orbit. Dubbed ET-94, it was intended for the Space Shuttle Columbia, but wasn’t used after Columbia disintegrated returning to Earth in 2003. ET-94 will join the Space Shuttle Endeavour at the science center, but first the behemoth tank must be moved, no small task for a piece of equipment that, laying on its side on a flatbed transport, will tower more than three stories high and extend 154-feet long. But Grissmeyer is no newcomer to big logistics projects that require SCE power lines and equipment to be temporarily rerouted or moved. In 2013, she helped with SCE’s planning for the transport of six 100-foot-long coke drums along Pacific Coast Highway to the Chevron refinery in El Segundo. For the external tank project, Grissmeyer and her team spent months planning and coordinating with the science center and all the agencies and jurisdictions involved. They also walked the entire length of SCE’s portion of the 16-mile trip to detail the work that needed to be done. The science center is paying all of SCE’s costs. Over the last week, SCE crews loosened and added slack to cables at various locations so power lines can be lowered the night of the move. They also rerouted electricity to alternate circuits so customers’ power won’t be interrupted. SCE’s biggest challenge is the intersection at Fiji Way and Lincoln Avenue after midnight. 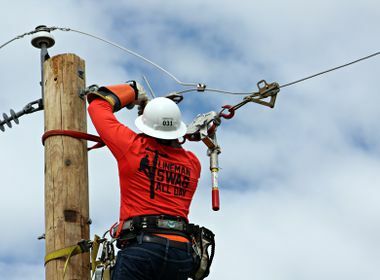 Crews must raise or lower SCE telecommunication, transmission and distribution lines as well as coordinate with other third-party utilities. SCE’s telecommunication lines, which transmit information to grid operations about the performance of the system, will be lowered into a slot in wooden ramps, which the tank transport will drive over. 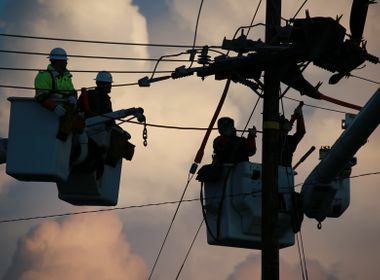 Once the tank passes each intersection where SCE advance work has been done, it will take about two hours to restore all the lines, cables and other equipment. SCE’s portion of the project is expected to end mid-afternoon Saturday.